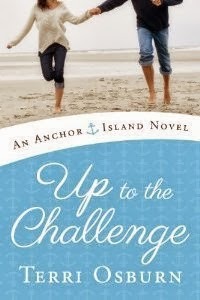 Up to the Challenge is the second installment of the Anchor Island series by Terrri Osburn. This author is new to me, but I loved this book. So much so, I want to go back and catch up on what I missed in the first book. In this book we focus on Sid and Lucas. Sid just so happened to get a second chance at the love of her life when he strolls back into town to help his family. Sid has also volunteered to help out with the family crisis and didn't realize Lucas would be there. The sparks fly in this addition to the Dempesy family saga. Tough-as-nails boat mechanic Sid Navarro is happy to trade her tools for an apron to help the Dempseys in their time of need. That is, until she realizes she'll be working alongside Lucas, the man she's loved from afar since she first laid eyes on him in high school. Lucas could charm the paint off a schooner, but Sid knows she doesn't fit his girl-next-door type. To show her true feelings would mean certain heartbreak, but the temptation of Lucas in her bed might be more than she can resist. After a rocky start punctuated by verbal barbs and exasperating arguments, things heat up between them—big-time—but their steamy affair turns more than casual in a matter of weeks. Sid's life has become the dream she's always wanted, and Lucas has fallen hard for the last woman he ever expected to love.